Contra Costa County, CA – The Contra Costa Transportation Authority (CCTA) has announced an exciting partnership with Scoop Technologies. CCTA will utilize its transportation demand management program known as 511 Contra Costa to provide carpool incentives to Scoop passengers who carpool from locations in Contra Costa. The pilot program aims to decrease the number of cars on the road and lessen the traffic congestion by offering $2 off rides to Contra Costa residents. To qualify for the pilot program residents need to download the Scoop app to connect with fellow commuters in their area. The pilot launches today, Monday, May 22, and commuters can start scheduling carpools now. Bay Area commuters waste more than half a million empty seats each and every day, causing increased pollution, slower travel times and an enormous burden on our transportation network. The Scoop app connects people traveling in the same direction to and from work so they can share their commutes. The partnership between CCTA, Scoop, and 511 Contra Costa is aimed at encouraging commuters to share their ride to work, which in turn reduces the overall number of cars on the road. “Mobility is a key factor in our region’s economic vitality, and we’re excited to see how innovative technology could incentivize people to change their behavior and consider new ways of commuting to work or school. Our goal is to keep Contra Costa moving and programs like this help commuters, the economy and the environment all at the same time,” states Randy Iwasaki, Executive Director for the Contra Costa Transportation Authority. This program comes at a time when the Bay Area is ranked as having the second worst traffic in the nation. Carpooling has historically been difficult, but Scoop makes the process easy, efficient, and flexible through their application. Commuters can download the app at takescoop.com and enter their home and work locations. On a trip-by-trip basis, they’ll enter their commute details. At the scheduling deadline (9 PM the night before or 3:30 PM the day of for the afternoon commute) Scoop will match commuters together in safe and efficient carpools. All payments are handled inside the app, as well as directions and contact details for the trip. Since launching in 2015, Scoop has become the nationwide leader in carpooling. To date, commuters have taken more than 650,000 Scoop trips, offsetting 1,750,000 in commute mileage and lowering carbon emissions by 1,300,000 pounds. Scoop is currently available to commuters who work in over fifteen Bay Area cities. Integral to Scoop’s business model are its relationships with local government and public authorities. Bay Area wide, Scoop partners with major employers, office parks, and local governments to offer employees an affordable and effective transportation solution. Funding for the carpool pilot is provided by the Bay Area Air Quality Management District’s Transportation Fund For Clean Air Program Manager Funds and Measure J.
Scoop Technologies Inc. is a San Francisco-based company that helps commuters save time, money, and the environment through easy, automated carpooling. The Contra Costa Transportation Authority is the county’s designated Congestion Management Agency, responsible for maintaining and improving the county’s transportation system by planning, funding, and delivering critical transportation infrastructure projects and programs. More information about CCTA can be found online at ccta.net. 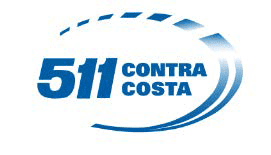 511 Contra Costa is the county’s transportation demand management program that provides initiatives aimed at reducing the use of single occupant vehicles by reducing congestion and greenhouse gases.